Shipping presidents and their families around is expensive business. Due to obvious security risks they cannot just buy a plane ticket and get in line like the rest of us do. And the president must be able to direct the military securely at all times. That said, some are more than willing to take advantage of the travel perks that come with being members of the first family. We’ve come a long way from President Harry and First Lady Bess Truman. When his term as president ended that was it. As the story goes, he and Bess packed up their car and drove back home to Independence, Missouri. One need not worry about seeing that happen again. Mr. and Mrs. Obama were under no compulsion to be responsible with the travel budget. They understood that they were traveling on the taxpayers’ money, not theirs. So they made the most of it. In fact, they made the most of it to the tune of $114 million. Just how many trips did Michelle and the kids need to take to Aspen? “Judicial Watch announced today that it obtained records from the U.S. Department of the Air Force and the Secret Service in response to a Freedom of Information Act (FOIA) request and two FOIA lawsuits for travel expenses by the families of former President Barack Obama and President Donald Trump. Compare this to what the Trumps have spent thus far. Here is a small sample of Obama travel expenses. Note the hotel costs alone. Michelle and her two daughters went to Aspen. And she ran up a hotel bill of $76 thousand? How can that be? We understand part of that was for Secret Service agents. Still, this is an outrage. If it cost that much to house her, her kids, and her entourage, she needed to stay in the White House. If you are not furious yet, this ought to do it. This is a farce. Mr. Obama is no longer president, yet we are still expected to pay his travel expenses? He’s run up $1 million in hotel bills since he left office. And almost that same amount on “miscellaneous” expenses. To add to this outrage, where he went is a secret. Due to their being a potential target for hostile acts, former presidents and their families receive Secret Service protection. But the Obama’s have been allowed to get on the government gravy train, and apparently remain on it. 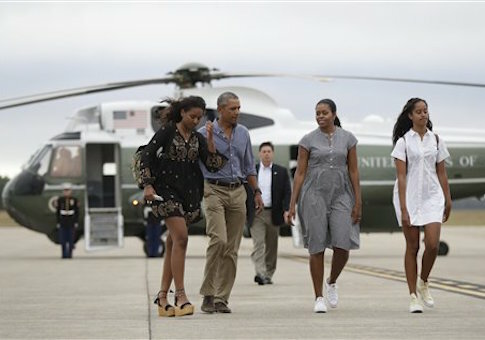 The Obamas clearly had a sense of entitlement. They saw their chance and took advantage of it. It’s far past tine that their expense account be ended. Let Mr. Obama’s wealthy supporters pay to fly him around.